» Inspiration from a Novelist: What Drives You? Why are you driven to do what you do? This story came out of my insatiable curiosity about the afterlife. I remember even as a child that I spent a lot of time looking up into the sky wondering where I came from, and where I’d be going when I died. We attended church in my formative years, but I continued to seek out answers, so much so that I often felt like I was just a visitor here on Earth, and had to find out more about what waited beyond. I think some of this came from the fact that my family lost people when I was still very young, and so death was an immediate thing I had to deal with during a time when I was still so new to life. My curiosity compelled me to delve into a number of religions over the years, and I found so many similarities between them I began to seriously doubt that any one had better answers than another. I was also fascinated by the way scientific concepts and the more mystical ideas of “life force” and “chi” were finding common ground. I started practicing some of the “new wave” thinking of setting intentions, following one’s intuition, and proceeding as if the universe is there to support you. I was stunned at the way doors would open and opportunities would fall seemingly out of the sky. I’m still seeking answers, but one thing I’ve learned over and over again is that our own personal energy (whether positive, negative, or neutral), our attitudes and personalities, and the intentions we set all greatly affect our experience of life. Which gave me the idea: What if the same occurs in the afterlife? What if the afterlife, too, is greatly affected by who we are, our beliefs, our attitudes, our expectations? And if that’s the case, what might different people find there? My main character, Loreena Picket, a blind young woman raised in “cowboy” church in a small town in Idaho, gave me a way to explore that question. What I find usually happens, though, after a few days of being discouraged, is that I have this angry energy that kicks in, where I get kind of a “what the hell” attitude going. I’ve found that to be really beneficial over the years, as it gives me the grit I need to overcome the rough spots. It was this same anger that propelled me to a first place win in a Young Artist’s competition when I was in high school playing the French horn. I was sick of getting nervous every time before I played, and on the day of the competition, I got ticked off about it, and performed much better! So I’d highly recommend anger—in the right doses, of course. Tell us about a moment of blissful success. I’ve been lucky enough to have several moments of feeling successful along the way. 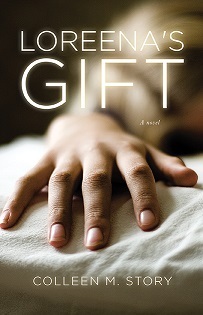 Loreena’s Gift placed first unpublished novel in a national contest while I was still working on it, which was very encouraging, and I ended up getting offers from four publishers before I eventually signed—all of which felt awesome after so many years working away, unsure if I’d ever get anywhere. But I have to say that so far, I felt the most “blissful” success when members of my family responded to my stories. My mom remains Loreena’s biggest fan, and has told me many times how the story has been a comfort to her—something I never would have expected. My older brother, who hasn’t done much fiction reading for decades, read my first book, Rise of the Sidenah, enjoyed it, and became someone happy to spread the word about my work. And my youngest brother, who was never a big reader, just finished reading the same book a few weeks ago and sent me an email that made me cry because it was so moving. The story really touched him, and he “got” some of the deeper meanings, which was hugely rewarding for me. I mean, we all hope that readers enjoy our work, but we also know we can’t just expect friends and family to be our biggest fans—we have to keep those relationships separate from our work. So to have people I care about so much give me such incredible feedback makes me feel very fortunate. Do you have an inspiring quote or saying that helps keep you motivated? I’m working on the second draft of The Beached Ones, my next novel. I’m also really enjoying my efforts with Writing and Wellness, an inspirational blog for creatives, and have some bigger projects planned with that I hope to complete by the end of the year. Self doubt can get all of us. Motivation from our surroundings is definitely awesome to have, but each of us is also motivating other people who surround us. This is something to be grateful about. Thanks for sharing this.. very inspirational. Yes, Rada, and sometimes motivating someone else is just what we need to get back on track ourselves. Thanks for reading! This is very inspiring for anyone feeling discouraged with where they are. I think it is the best time to really look at what I am doing and see what I can change to improve the situation. I remind myself “Never give up…just keep moving forward.” Thanks for sharing. Great words to live by, Sabrina. Keep moving really helps me when I get discouraged as well! Good advice, Sabrina. Just keep going. Sometimes that is the only thing we can do but so much better than the alternative of stopping. I can look back on many times when it seemed I was doing no more than treading water, but you can see in hindsight the progress you made. Best to you! Thanks so much for the opportunity to share with your readers, Susan. Love your work and so grateful for the connection! Thank you, Colleen! I just love this! It is very rewarding when family enjoys the work you’ve done and supports you. So true, Joie. I didn’t expect it so it was a lovely surprise. Reading about Colleen’s struggles and doubts helped me understand how important perseverance, belief in oneself, and positive feedback are in our personal and professional success. I totally relate to her use of well-directed anger, haha! Loved the interview as the blog topic this week, good stuff. Aren’t they, Meghan. And I love the well-directed anger part too! Thanks, Meghan! Belief in oneself is the hardest one, I think, We need all the tricks we can get to keep that one going! This is really inspirational. Thanks for sharing some insight into how to deal with adversity and stay inspired. Thanks for sharing so much about your journey, Colleen. Reading this I wondered if you had explored Anthroposophy (Spiritual Science), especially as you have a curiosity about the afterlife and about our human and spiritual journeys. I related to all the self-doubts you expressed along the way to having your novel published. Writing is often the easiest part, the rest is what brings us the challenges. Appreciate hearing about how your explorations and growth on your journey, has allowed so many wonderful things to unfold for you! All the best with your next steps. Colleen, there is so much here that verbalizes what many of us have felt. I, too, have wondered if we will have a participatory relationship in our afterlife – if we will have influence in it. Also, I LOVE the idea about proceeding as if the universe is there to support you. What could it hurt? Good to know I’m not alone, Joan! :O) And every time I’ve made the leap assuming things would work out they kind of magically do, giving me more evidence of that “supportive” theory. It’s kind of eerie sometimes! This was so inspirational. I too am afflicted with self-doubt and it’s always encouraging to hear an honest success story from one who has been there. It’s wonderful when anger, often considered a negative emotion, can fire you up to achieve more.My family rarely reads anything I write (except my mother! )but every now and again I’ll get an email or text from a son telling me how much they enjoyed a post and it truly is the most “blissful” feeling of success. Isn’t it just blissful when someone, especially a son!, validates what you write, Tamuria! Love that! So true, Tamuria! My brothers hadn’t read much of anything I did until my book, so that was a welcome surprise. So cool that your sons notice your work even if only now and then. :O) And hey, anger is very underrated—especially in us “nice” women, right? I am driven by success… I like helping others and seeing results… that is success for me… or when someone else is super excited with what I have done for them, they see my value. When someone really gets excited with your help, isn’t that just the best, Kristen! So nice to see evidence of your efforts in someone else’s joy, for sure. I never knew exactly what had me get up each day to face whatever it brought with optimism rather than doubt. Having always been feisty, I think that propelled me to defend, conquer and generate. I couldn’t have articulated it, but a bit of anger does work. I’ve faced many challenges and appreciate the Universe providing me with exactly the right support. I’m still busy living life to the fullest, soon to be 77 & haven’t given any thought to the afterlife. Life on earth keeps me stimulated. How inspiring you are, Roslyn! You must be full of life and a joy to be around. Thanks for reading. Feisty is the exact word I’d use to describe you, Roz! Thanks for sharing your experiences with us Colleen. I was thinking of how you have handled discouragement. Some people seem to thrive on adversity, emerging from their valley with greater strength and deeper faith. Others stumble and fall, giving in to discouragement and dropping out of the race. The difference in outcome is determined by the way we choose to handle discouragement. You’re so right, Rachel, it’s all in what we do with it. We all have it in us—I’ve been fortunate enough to have a strong family background that instilled the “get going again” attitude in me. Wishing everyone the strength to get back up again! Hey, Kathy! So glad you stopped by, and thank you! Isn’t that the best quote? That’s a great book, too. Very inspirational! Interesting perspective about anger. I will definitely have to keep that in mind 🙂 Much to think about! Thank you for sharing. Thanks, Staci! I know—we’re kind of afraid of anger, aren’t we? But it works on occasion! Wonderful post Susan and Colleen! I enjoyed that quote so much that I just had to go read the book you recommended “Choosing Yourself”, thank you for sharing 🙂 Best of luck to you in your future writing and published books! I love that quote. I think too off we have a tendency to stiffle that fire within, stop listening to it because of all the “shoulds’ in our life. Thanks for the reminder to stock the fire. Will be checking out Loreena’s Gift. I love it too, Karen! Loved hearing how she pushed through and found the grit after getting fed up and a little angry! That can help throw you over a hump, real or imagined! I enjoyed this interview! I just love that part too, Kimberley. And used the tool this weekend, turning a bit of nervousness into anger, which took it right away! Re anger: Women can get extremely motivated by anger — particularly the “Oh yeah? Well, I’ll show you!” variety. 😉 I think that contributes to the fire within that she mentioned. I also believe it’s important to stay connected to all your emotions, understanding and owning them and allowing them to help create who you are…someone new in every moment. I think that was exactly what Colleen meant, Jackie! And as you say, it works so well! I love this interview. 🙂 Most of us are susceptible to self-doubt, but I eventually have to get out of my self-pity.I also tend to depend on my anger to get me to a point of motivation (or I just tell myself that the critic is full of nonsense) so I can get on with my writing! 🙂 Thank you for this; it’s always nice to know someone else shares my feelings. Thanks, Liz, and it’s so cool to hear from many other women tapping into the power that exists in anger. I think being taught to be “nice” from day one tends to make us a bit afraid of it—but it can definitely be a good self-motivator.